Virgin Atlantic Cargo is continuing to give customers a wider choice of pharma solutions by becoming the first UK airline to approve the use of CSafe’s new RAP container for temperature-sensitive life-enhancing healthcare products. Following its approval by both the U.S, Federal Aviation Administration (FAA) and the European Aviation Safety Agency (EASA), the unit has been approved by Virgin Atlantic’s own Operations specialists to be carried across the airline’s international network. 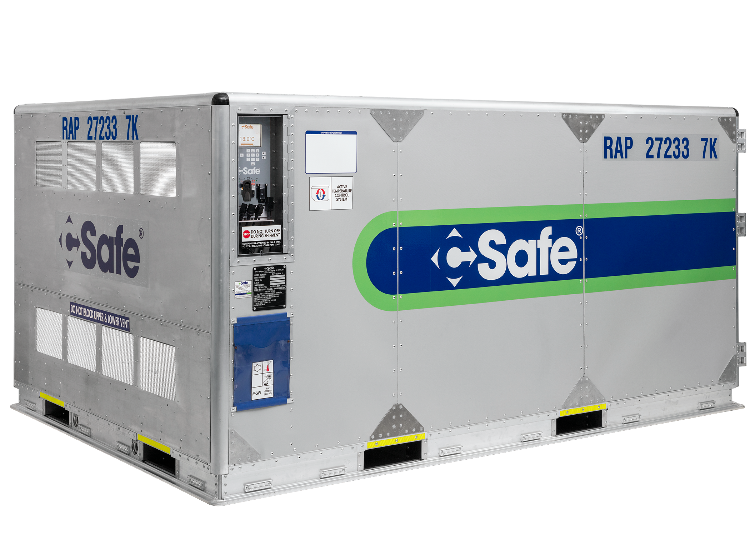 The CSafe RAP is the only FAA and EASA approved active compressor-driven container permitted in both the upper deck and lower deck cargo sections of commercial aircraft. Under the terms of its Master Lease Agreement with CSafe, Virgin is now accepting bookings for the new RAP container, providing customers with another highly cost-efficient solution for large shipments of pharmaceutical and life science products. Virgin already offers customers the opportunity to lease the CSafe RKN container as well as Envirotainer’s RKN t2, RAP t2, RKN e1 and RAP e2 units for temperature-controlled pharma products. The CSafe RAP uses CSafe’s active Temperature Management System (TMS) which utilises compressor driven cooling technology and a radiant heating system (depending on the ambient temperature), in conjunction with CSafe’s innovative and proprietary ThermoCor® vacuum insulation panel technology. This enables the unit to maintain a strict payload temperature setting throughout transportation, regardless of the actual ambient condition. With a maximum payload weight of 4,819 kg, the CSafe RAP is designed to accept up to 4 US wooden pallets or as many as 5 Euro pallets. It can also be bulk loaded directly on the floor of the container to increase payload volume due to the unique design of the under-floor air recirculation system, and offers an extended battery run time of up to 100 hours for typical shipments. The CSafe RAP has a temperature range that is user selectable from +4°C to +25°C, with operational capabilities achieving desired set-points even at extreme ambient temperatures (-30°C to +54°C). The growth of Virgin Atlantic Cargo’s pharma volumes is supported by the reach of its global network to major pharma markets in the UK, Europe, the U.S, India and China. Together with its joint venture partner, Delta Cargo, Virgin now offers almost a ¼ of all transatlantic cargo capacity, the world’s biggest pharma trade lane. In October, Virgin Atlantic opened its new Pharma Zone at Heathrow, a fully segregated area dedicated to handling and storing pharmaceutical shipments within a strictly regulated temperature environment with dedicated container storage. It incorporates two walk-in pods capable of maintaining 2-8°C (COL) and 15-25°C (CRT) temperature ranges for loose pharma shipments and, high above the floor of the Pharma Zone for added security, a temperature-controlled storage system for 24 pallets, split into 6 separate chambers, each of which can be safely maintained within either a 2-8°C or 15-25°C temperature range. Good Distribution Practice (GDP) training has also been delivered to the team of specialists working in the Pharma Zone. The airline has now commenced its application for Wholesale Distribution Authorisation (WDA), developed by the UK’s Medicines and Healthcare products Regulatory Agency (MHRA), which will confirm its compliance with Good Distribution Practice (GDP).